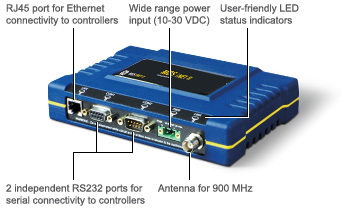 The MDS iNET Series is an industrial wireless solution that provides long distance, unlicensed communications allowing users to interface with Ethernet and serial controllers. Comprised of the iNET 900 and iNET-II, the iNET Series offers the best balance of speed and range to enable a wide variety of applications requiring higher data capabilities than typical communication systems can provide. The iNET Series combines the higher speed of Digital Transmission Systems (DTS) with the robustness of Frequency Hopping Spread Spectrum (FHSS) technology. Upgrade your existing iNET II network to the MDS Orbit Platform today! Download the iNET II upgrade whitepaper to learn more about the benefits of migrating to meet modern network requirements. The iNET-II radio operates in the 900 MHz frequency band under the FCC rules for Industrial, Scientific, and Medical (ISM) equipment. Every system must have at least one access point service. You can choose between remote models that support serial only, Ethernet only or both types of interfaces (4 dual gateway). The iNET-II handles concurrent Ethernet from multiple sources, directly addresses the integrated serial device server using industry-standard protocols (e.g., Telnet, TCP, UDP), and serves as backhaul to MDS TransNET, SD, 4710 and 9710 radios. Every iNET-II radio includes an SNMP agent and can be managed by MDS NETview or any other SNMP-based management system. An access point radio can be configured to operate as a remote, serving as a common replacement for remote locations, thereby simplifying maintenance tasks in the field.